Clubhouse will be closed April 22 - May 24, 2019 for renovations and repairs. The Clubhouse is for owners and guests only. Facilities at the Clubhouse include indoor and outdoor pools, hot tub, fitness room, great room with a projection TV and surround sound, game room with pool table, various video games and pin ball machine, kitchen, living room/reading room, piano, BBQ area, children’s playground. BYOB. DVD and VCR library. Based on the demands for Clubhouse use by large parties we now have a Clubhouse use request form. This is to be used for any large parties other than normal family gatherings and only approved for use during regular operating hours. Special use during non-operating hours must be approved by the Board of Directors. Chimney Hill owners will take precedence when requesting use. This request form will help us with conflicting use and allow us to know when larger groups will be using the Clubhouse. Forms can be obtained at the Chimney Hill Clubhouse or Administration office. Fishing is allowed for our owners and guests only. We do encourage a catch and release program, but if the fish is injured and/or bleeding do not put it back as it will die (if hook is embedded, "gut hooked", cut hook line as close to mouth as possible and release, the hook will eventually dissolve). We stock with rainbow trout – and they are great eating fish. We do request a one fish per day/per family limit. Please do not throw trash, bottles, wood or other items in the pond and please clean up your or any other rubbish found at the pond. This is a beautiful area, let's keep it that way. Please leave our pond better than when you found it. Help us keep it clean! 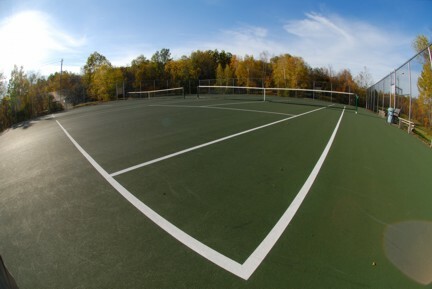 A few items to remember: no skateboards, bikes, in-line skates or roller skates are allowed on any of the tennis courts. This will cause damage to the surface and result in costly repairs. The court at the Clubhouse is lighted for evening play. Requests for lights are to be made to the Clubhouse staff. Use of lighted court will be until 15 minutes prior to the closing of the Clubhouse. In the winter the ice rink is open from 9:00 AM to 10:00 PM, weather permitting. A variety of ice skates are available at the rink warming hut but please return them to the hut when you are done with them. Ice grooming will take place from time to time and the rink will be closed during grooming. Please do not shovel snow off of the ice as this will hamper grooming and cleaning of the surface. Snow removal from the surface will be done as soon as possible after a storm. The following Clubhouse Rules and Regulations are necessary to protect all those who use the Clubhouse. Please follow these for your enjoyment and those of our other guests. Failure to abide by the rules and regulations are grounds for removal. All those who use the Clubhouse MUST SIGN IN at the front reception desk. The Clubhouse is open to Chimney Hill owners and Guests. Owners must be current in their assessments (both regular and special) to use the Clubhouse and recreational facilities. Renter/Guest fees must be paid for your guests or renters to use the Clubhouse (this is not in lieu of your assessments). Owners in good standing who accompany guests are not required to pay the renter/guest fee. Children under the age of 15 must be accompanied by an adult 18 years of age or older. Use of the Clubhouse facilities is at your own risk, this includes the exercise room. There is no lifeguard on duty for the indoor or outdoor pools – swim at your own risk. Please note that use of exercise equipment is at your own risk and those under the age of 15 are prohibited from its use. No food items or glass beverage containers are allowed in the indoor pool area, hot tub, changing rooms/showers or exercise room. Swim diapers must be worn by children not toilet trained. Failure to use swim diapers resulting in an “accident” will result in pool closure. Please shower before using the pools or hot tub. Children under the age of 12 are prohibited from using the hot tub. No alcoholic beverages are allowed in the game room or indoor pool/hot tub areas. Indoor & outdoor pool areas, hot tub and fitness room close ½ hour before the posted closing time. The entire Clubhouse facility is smoke free. The drinking age in the State of Vermont is 21 and will be enforced by the Clubhouse staff. Pets are not allowed in the Clubhouse or outdoor pool area. Please respect your fellow Clubhouse users and report any problems immediately to the Clubhouse staff.